It is that time of year to start thinking about Pack planning and fall recruitment! This year's recruitment will be allowing girls to join our packs! With that being said, it is up to your charter organization if they want to bring girls into your pack. For Pack Planning, please make sure to have the Ideal Year of Scouting at your fingertips! This is a great guide for planning your program year. School Night Kickoff August 7th at 6pm at the Belvoir Winery in Liberty! Get your school night materials and information on your school night recruitment. Please have at least one Pack and Troop representative at the kickoff. School Night for Scouting is the annual recruitment campaign for the Cub Scouts. Golden Eagle district recruits close to 400 new Cub Scouts during the months of August and September to join the adventure of a life time! For additional information, contact the Membership Chairman. Learn about the School Night Plans and what you can do to help promote your Pack. Does your pack have a completed Program Planning for 2015-2016 program year? Does your pack have a completed pack budget for 2018-2019program year? What school(s) does your pack recruit from? 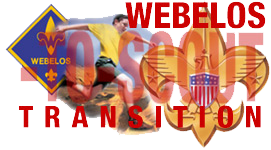 Webelos to Scout Transition Guide: A resource for Webelos parents, Den Leaders, Cubmasters, and Scoutmasters to assist in Webelos to Scout transition. If you have any questions about venturing, would like to join a crew or start one of your own, please contact Dusty Boatright at the Council Service Center. If you help start a new Cub Scout Pack, Boy Scout Troop, or Venturing Crew, you can earn the William D. Boyce New Unit Organizer Award. For more information, contact District Membership Chairman, Brent Cable. The basic premise of Scouting for youth with disabilities and special needs is that they want most to participate like other youth — and Scouting gives them that opportunity. Scouting is flexible and ensures that every youth does their best! To get more information, contact Colleen Chapman, ccchapman@mac.com.